The tests of Airbus Defence and Space’s SpacePlane demonstrator, May 1-4, 2014, validated the dynamic flight conditions encountered in the end-of-flight phase following a return from space. A potential European entry into the suborbital space tourism industry now has a few flights under its belt. 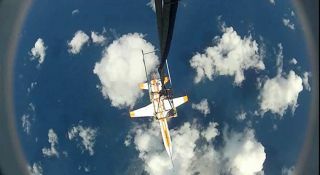 A quarter-scale prototype of SpacePlane, a vehicle being developed by the France-based company Airbus, took to the skies last month, giving engineers their first look at how the craft performs in the air. "Held on 1-4 May, the tests of Airbus Defence and Space's SpacePlane demonstrator validated the dynamic flight conditions encountered in the end-of-flight phase following a return from space," Airbus representatives wrote in a June 4 statement. During the tests, a helicopter lifted the 15-foot-long (4.6 meters) demonstrator vehicle off a boat, which was stationed 62 miles (100 kilometers) off the coast of Singapore. The chopper carried the unmanned SpacePlane mockup to an altitude of about 10,000 feet (3,000 m), at which point the craft was released to glide back down to Earth. "It was then piloted from the barge as it made its return to the ground, ending its flight at sea before being picked up as planned a few hours later," Airbus representatives wrote. Airbus has been working on SpacePlane for nearly a decade but has said very little about the project publicly. In 2007, the firm — then known as the European Aeronautic Defence and Space company (EADS) — revealed that the "space jet" would take off like an airplane and carry four passengers up to an altitude of 62 miles. The space plane project would cost about 1 billion euros ($1.35 billion at current exchange rates), EADS representatives said in 2007. The firm did not plan to operate the vehicle but instead intended to sell it to tourism companies. Seat prices would be at least $200,000, according to estimates at the time. Artist's concept of EADS' "space jet" rocketing into suborbital space. The SpacePlane demonstrator, which was built for Airbus by Singapore firm Hope Technik, should get another set of workouts next year. Airbus officials said earlier this year that they planned to conduct drop tests from 100,000 feet (30,000 m) in 2015 using a stratospheric balloon if the May flights went well. Airbus isn't the only company developing a suborbital space plane. Virgin Galactic's six-passenger SpaceShipTwo, for example, has already completed three powered flight tests and may be flying customers by the end of the year. Lynx, a one-passenger vehicle being built by XCOR Aerospace, could be up and running at around the same time.